At Eagle Superabrasives, we manufacture our diamond sharpening wheels to last longer and remove more material, saving you time and money. Our polycrystalline diamond sharpening wheels feature a vitrified bond system. We carefully combine sintered vitreous materials with diamond powders and coating to ensure both a chemical and mechanical adhesion of the abrasive particles with the bond structure. Therefore, our wheels are better at resisting premature diamond pull out. We design our diamond sharpening wheels with a specific wheel structure that incorporates increased porosity that aids with coolant delivery. By allowing coolant to easily reach the point of grind, the diamond sharpening wheels better resist getting loaded up during use. By using a vitrified bond, our wheels can offer a tool life over 150 times more than diamond sharpening wheels with resin bonds. Additionally, our wheels are easy to dress on a machine. For super finish grinding, a D6 – D9 Micron grit works best. Alternatively, D22 Micron grit is ideal for rough grinding. Our most common wheel shapes for our diamond sharpening wheels are 6A2 and 12A2 styles. Their core shapes are rigid and most often used on dedicated PDC grinding machines like Coborn, Toyoda and Waida. Our 6A2 wheels are ideal for knife grinding, surface grinding, edge grinding and saw grinding. The wheels feature either phenol, polyimide and hybrid bonds. A CDX wheel features a combination of diamond and CBN powders. 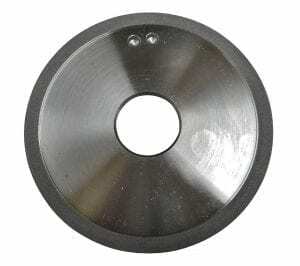 As a result, it is ideal for grinding steel and tungsten carbide tools. The 12A2 wheel is great for tool and cutter grinding, face grinding, top grinding and off hand grinding. Available bonds include phenol, polyimide, hybrid and electro-chemical. The wheel can be made up to 16” in diameter. For all your diamond sharpening needs, contact the experts at Eagle Superabrasives.